It's the summer of AD 79, and Flavia Gemina the sea captain's daughter along with her friends Jonathan the Jewish boy; Nubia the African slave-girl; and Lupus the homeless beggar-boy set sail for the Bay of Naples, to stay with Flavia's uncle near Pompeii. They are soon absorbing in trying to solve a riddle that may lead to treasure. But then tragedy strikes-Mount Vesuvius erupts and the children are fleeing for their lives, in one of the worst natural disasters ever recorded. Not just a mystery-an absolutely thrilling action adventure that makes you feel you were there! 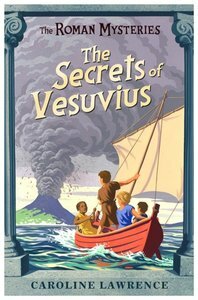 About "The Secrets of Vesuvius (#02 in Roman Mysteries Series)"
Caroline Lawrence grew up in California and went to England when she won a scholarship to Cambridge to study classical archaeology, which she followed with a degree in Hebrew and Jewish studies at the University of London. She is the author of The Roman Mysteries, which has been turned into a television series for BBC.